Some people are Cat People. Some people are Dog People. Sometimes a Cat Person marries a Dog Person. And sometimes a person is both a Cat Person and a a Dog Person. So... regardless of how it comes about, quite often a new kitten must learn to get along with the family dog. So... what is the best way of introducing a new kitten or cat into a dog household? There are 5 things a cat and a dog need in order to build a happy relationship. Adjusting to a new home and new people is stressful. It's best to allow the kitten to become accustomed to one new thing at a time. Start by giving it a chance to become accustomed to a dog-free environment first. You can confine the kitty in one room, or confine the dog to one area of the house. Once the kitten is comfortable with you and its new surroundings you can begin introducing it to the canine family member. How long the kitten takes to feel secure and gain some self-confidence in its new surroundings can vary greatly. It may take as little as a few hours or a few weeks of confining the cat to a small area. Your cat will let you know when it is ready. Do not push the issue. We do not recommend purchasing a kitten as a gift for someone else. Allow the new owner to choose their new kitten personally. After the kitten has had time to acclimate to it's new home and people, can allow the dog and cat to see each other from a safe distance. This way they can express their curiosity in safety and if the kitten feels threatened, it can easily leave without being chased. The first introduction of cat to dog is a delicate negotiation that is best conducted with understanding of cat and dog behavior. The key is to make sure the kitty has an place where it can get away from the dog if it feels threatened. Because is the cat who is most likely to be intimidated by the dog, it is the cat who you must allow to set the "pace" of the introduction. The first step is to allow the cat and dog to become used to one another. control the dog of it barks or lunges. if the dog gets up or acts in any way that the kitten feels threatened, correct the dog and make it lay/sit again. Even after successful introductions have been made, you must still provide some supervision to protect your kitten from being chased or even from the too boisterous play of an affectionate dog. It all depends upon their individual personalities. And perhaps it depends a little bit on how well you orchestrate those first few meetings. So good luck! 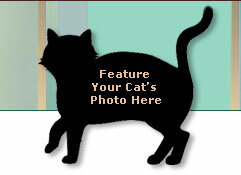 Your cat can be a star! in the graphic at the top of this page? Or another article of your choice?